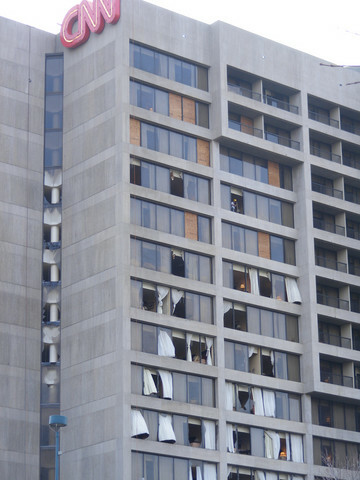 Damage to the CNN building in downtown Atlanta, GA following a tornado on the evening of March 14, 2008. A recent study by experts on land-atmosphere interactions suggests a connection may exist between large urban population centers and the intensity of tornadoes that impact these areas. The urban heat island effect is the term given to the hot, dry conditions generated by large expanses of buildings, asphalt, and other human-made conditions that alter the landscape otherwise covered by fields, forests, and bodies of water.Â Decades of research have indicated that large urban areas reach higher temperatures during the day, stay warmer at night, and tend to have drier air surrounding them, as there is little open water or moist soil to provide atmospheric moisture. 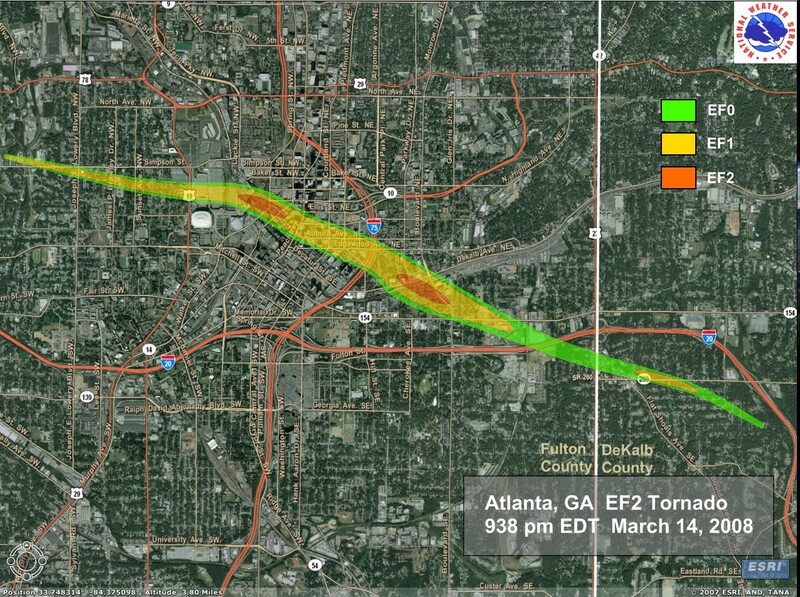 The study indicates a connection between the intensity of the 2008 urban Atlanta tornado and the heat island effect suggests that the hot, dry urban conditions may have led to a larger discrepancy with the surrounding atmospheric conditions, enhancing stability and thus intensifying the storm as it approached the city. 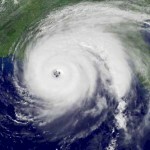 However, not all meteorologists and climatologists agree.Â Harold Brooks, a research meteorologist at the federal government’s National Severe Storms Laboratory, in Norman, Okla., said it is already widely accepted that wet ground breeds tornadoes, and noted that strikes on urban areas aren’t rare. There is no evidence suggesting downtown areas are hit “any less or more than any other area of the same size,” Mr. Brooks said. In the past decade, tornadoes have hit Nashville, Tenn.; Fort Worth, Texas; and Miami, as well as Atlanta, he said. 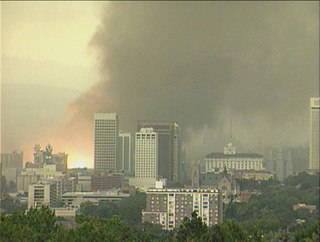 A tornado strikes downtown Salt Lake City, UT in 1999. The myth that tornadoes are less likely to strike urban areas continues to remain pervasive, even in the face of evidence to the contrary. It is a common – and definitely false myth that tornadoes do not strike downtown areas. The odds are much lower due to the small areas covered, but paths can go anywhere – including over downtown areas.Â St. Louis, MO, for instance, has been struck 4 times in the last century. It may seem tornadoes impact urban areas less frequently than rural areas simply because urban population centers cover a much smaller fraction of land area than rural areas.Â As such, any given tornado is more likely to impact a rural wheat field in Kansas rather than the urban core of a city such as Wichita or Kansas City. For a more exhaustive list and details, see the table compiled by Roger Edwards and Joe Schaefer of the Storm Prediction Center on downtown tornadoes. Pingback: Does the sustainability community have anything to contribute to the latest tornado disaster recovery? | Bobaganda! I live in Oklahoma and have witnessed this occurrence. On cooler days after extreme heat it will be routine to witness large wind circulations due to sinking cooler air and rising warm air. After the storm passes over a populated area the wind circulations will quickly dissipate. Easy to observe.